Garages and workshops can be dangerous places due to the many hazards looming around in the form of fire, injury, electrocution or other seemingly small things. In a garage, you are surrounded by all manner of elements, which can pose as a serious hazard if kept in the same place. 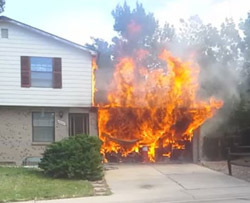 Mixing flammable liquids such as paint thinner and gasoline near a flame could make the whole garage go up in flames within minutes. You could also be risking the lives of those surrounding you. There are simple steps you can take in order to prevent accidents in your garage and keep you safe. It is better to be safe and work slowly than rush things at your workplace without taking the necessary precautions to prevent an accident from occurring. It all starts with organization. Good storage habits need to be observed in the garage to prevent accidents. When you think about your garage as a storage facility, which it is, you will see that there are lots of potentially dangerous items… especially for kids. Presence of sharp tools, nails, screws, and empty bottles and cans can cause real injury to children. The garage door can as well be a danger. It’s important for your kids to be well educated on the looming dangers in a garage when in or around the garage. Garage door switches need to be located high up so that they are out of the reach of children and garage door sensors should always be properly in place. It is always good to be prepared to face situations when things don’t go as planned in the garage. At any moment, a spring could come loose or an installation fault occur. Proper installation of a garage door opener is key to prevent serious injury. Ensure that all the closets, shelves, hangers, are well secured. Accidents are bound to happen when there is an overload in the shelves and closets. Always use appropriate hardware to install and assemble storage solutions including large heavy objects. Always keep sharp objects and edges tucked in facing downwards or inside a protective covering. Use proper lifting form (bend your legs!) when lifting heavy objects. Lower back injuries are not fun and are all too common. Place any extension cords or air hoses back in their “home” when not in use. Extension cords which have been left carelessly lying on the floor can lead to trips and falls which combined with sharp tools and corners in a garage is not a good combination. Consider investing in an extension cord reel and/or air hose reel to keep things tidy and out of the way. Small and loose items like screws, nails, nuts, and bolts should be properly stored. Such small and sharp items can cause various types of accidents. It is good to keep them in a well organized manner. Always unplug electrical appliances after use. Such equipment left in a socket can cause electrical shock, overheating, power wastage, accidental activation and fires. Properly dispose off chemical paints, thinners, solvents, chemicals, pesticides and all the combustible supplies. It is advisable not to store anything which is considered a fire hazard. Make it a habit to clear the garage of debris. Use a vacuum to immediately clean up spills, sawdust, grime, soil and lint. You should also discard trash promptly. A clean and organized garage is a safe place to work on and minimizes accidents. Always have a fire extinguisher and a carbon monoxide alarm. Have a certified electrician check your wiring often so that he can quickly detect faulty lines. Such safety precautions can go a long way in protecting your garage. Always wear protective gear to protect your hands, ears and eyes. When your skin is exposed to toxic chemicals you risk developing serious health complications. Any activity that involves grinding, welding and or drilling should be done far away from eye exposure as it creates dirt or gives off sparks.